So much for good news, just a short time after he walked thru the locker room with no noticeable limp, it was learned that Patriots’ running back Dion Lewis will undergo “clean-up” surgery and be shelved indefinitely. Adam Schefter from ESPN broke the story that Lewis will undergo a second surgery. Lewis who hadn’t been seen since the last day of minicamp was seen by the media strutting thru the locker room during the open phase on Sunday. Since he’s been MIA since June, it was seen as a positive sign. Now he’s going to ….at a minimum begin the season on PUP and perhaps even wind up on IR. This latest setback is expected to last 8-10 weeks which would put Lewis on the cusp of PUP and possibly landing on IR if he isn’t ready by then. So what do the Patriots do in the meanwhile? Well, it immediately opens a spot on the 53-man roster. We had already projected Lewis to start the season on PUP so that part is no surprise. That opens a roster spot that we believe will go to…right now Tyler Gaffney. It could also open the door for someone like Donald Brown or D.J. Foster to make the roster, but both have missed a ton of time. One thing is for sure now, and that is James White’s spot now appears locked as he’s now the best pass catching RB on the team. The Patriots depth chart currently consists of: LeGarrette Blount James White Brandon Bolden Tyler Gaffney Donald Brown Joey Iosefa and D.J. Foster. 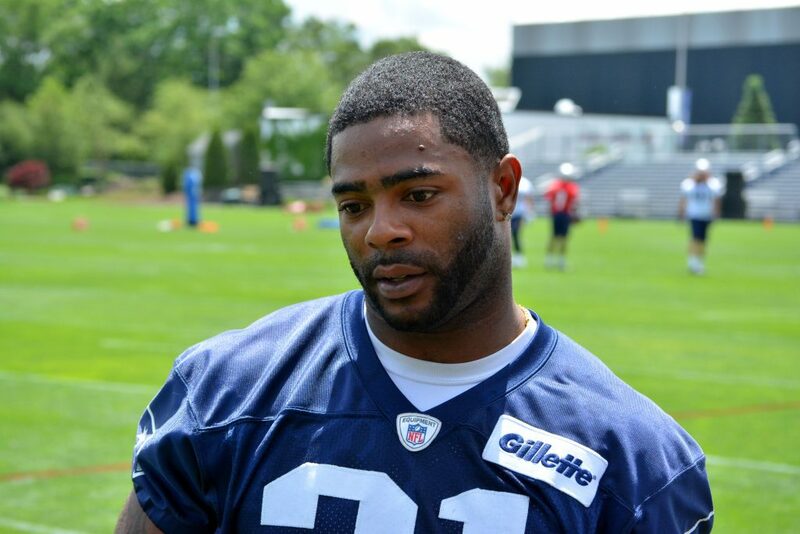 Blount, White, and Bolden appear to be roster locks. The remaining players will fight it out for the final spot. FB James Develin is a lock and could be listed here or with a separate category. Work a Trade? The Patriots could be trying to work a trade or will wait and watch the waiver wire for a suitable pickup. This was something Paul Perillo of PFW said during the broadcast of the game on Thursday. He mentioned the Titans and Bishop Sankey. He’s got good size and is a Patriots type player and would be a good fit. Tennessee is loaded at the position with Derrick Henry, DeMarco Murray, Dexter McCluster, Antonio Andrews, David Cobb, Bishop Sankey and Devid Fluellen. Sankey could possibly be had at a bargain price with their depth. Other trading partners could be either Dallas or KC. The Cowboys just drafted Ezekiel Elliot, to go along with Alfred Morris, Darren McFadden, Lance Dunbar and sixth-round pick Darius Jackson. McFadden would be the obvious choice to get cut loose. Especially with the way Morris ran this week. Would Dallas and Jerry Jones look to help Kraft and the Patriots out? Hmmm. A more likely deal could be had with the Chiefs and Andy Reid. Knile Davis seems the odd man out in KC and he had an impressive playoff game against the Patriots a year ago, right up until his fumble. But regardless, the situation with the Patriots running backs and Lewis went from a wait-and-see to a position of need. It was hoped that Lewis would be back to start the season. Now the earliest that will happen looks to be early November. This entry was posted in Patriots Commentary, Patriots News and tagged 2016 Patriots Roster, 53 Man Roster Projection, Bill Belichick, Bishop Sankey, Brandon Bolden, D.J. Foster, Darren McFadden, Dion Lewis, Donald Brown, James White, Joey Iosefa, Knile Davis, LaGarrette Blount, New England Patriots, NFL, Patriots, Patriots running backs, Tyler Gaffney on August 21, 2016 by Steve Balestrieri. The Patriots are done with spring OTAs and Minicamp and are now, more or less on their summer vacation before training camp begins roughly six weeks from now. But while the players may be enjoying some down time, it is time for Bill Belichick, Nick Caserio, and the coaching staff to get some work done. Summer School, for lack of a better term. Here is our list of the five things that the Patriots need to work on during their summer “break” before camp begins. Then the 2016 season really begins for them. Just a teaser, there isn’t a mention of Deflategate or suspensions because, at this point, it is what it is. There does remain, however, plenty of other questions that need answering. 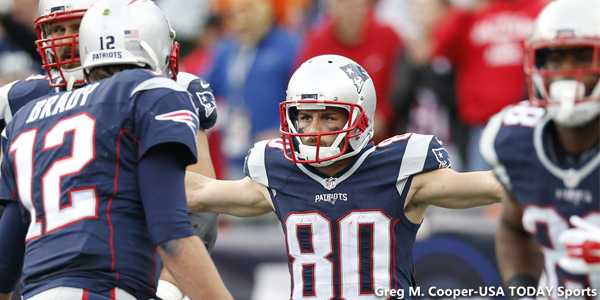 The Patriots have some key members of the team that will be free agents after the 2016 season. Most of the players are members of the defense and include but are not limited to, Jamie Collins, Dont’a Hightower, Malcolm Butler, Jabaal Sheard, and Logan Ryan. Collins’s contract may be the most difficult to get done, judging from the deals recently given to Fletcher Cox and the one on the table for Von Miller. Collins will get a ton of cash laid at his feet in free agency. He’s one of those rare athletic freaks that will be on a lot of team’s radars. The Patriots may have to franchise him to keep him around in 2017. Then the decision will be to either let him walk after that or break open the safe and pay him top dollar. That isn’t their normal modus operandi in these situations however. Hightower would likely command less money and doing a deal with him now would lower his cap hit for 2016. It would also free up enough money for them to do another deal, with either Sheard or Butler. I think they’ll wait out Ryan until next year and decide whether to keep him or if in the case of one of the younger corners stepping up, allow him to walk in 2017. Regardless, as Jeff Howe stated this week, the team has $60 million dollars in cap space to spend in 2017. They can get most if not all of these players signed. We saw the tweets this week, the Ravens are getting offers for tackle Eugene Monroe. With these offers on the table, the Ravens pulled Monroe off the practice fields. Are the Patriots one of those teams? And if so, would Baltimore trade to a perennial AFC power? With the injuries to starting tackles Nate Solder and Sebastian Vollmer last season and those two players still not on the practice field, the Pats may indeed be on the market. Dante Scarnecchia is back in the fold, so the Patriots obviously have faith that he can get the very best out of his players. But he isn’t a miracle worker and already has a tough task getting the interior of the offensive line straight. This situation will bear watching. At the running back position, the team faces a similar challenge. 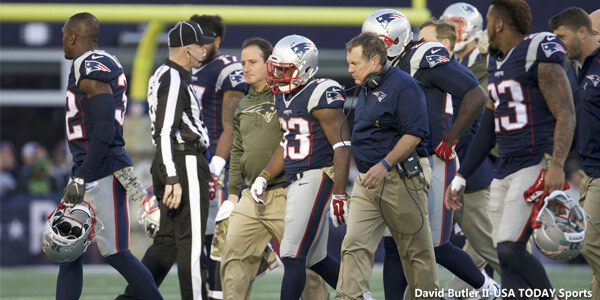 Both Dion Lewis and LeGarrette Blount ended 2015 on IR, and after them, question marks abound. 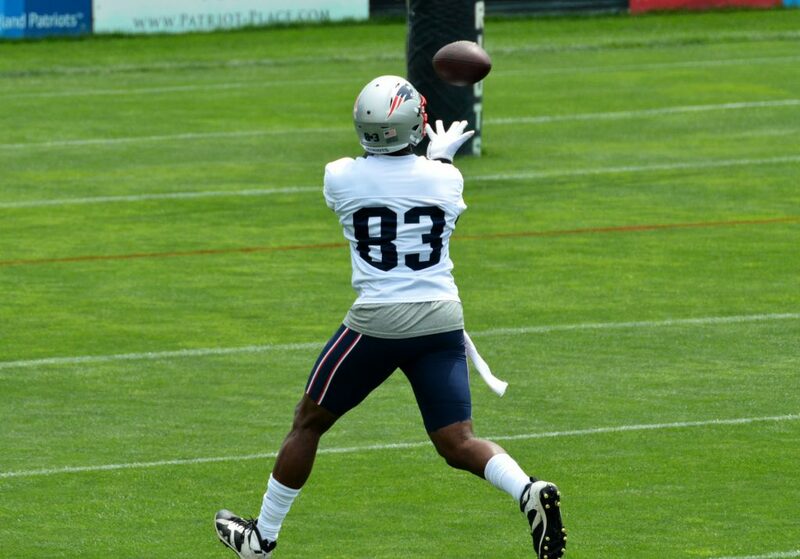 The Pats have very good pass catchers in Lewis, James White, free agent signee Donald Brown with UDFA D.J. Foster in the mix. But for a back in the running game, if Blount isn’t ready, then it’s over to Brown, Brandon Bolden who is primarily a special teams player or Tyler Gaffney. Rumors are that the team is interested in Bishop Sankey, with Mike Reiss and others stating that the Patriots may have been kicking the tires on him in the past two months. Sankey may indeed be on the market. The Titans have acquired Demarco Murray this offseason and then drafted Derrick Henry this spring. 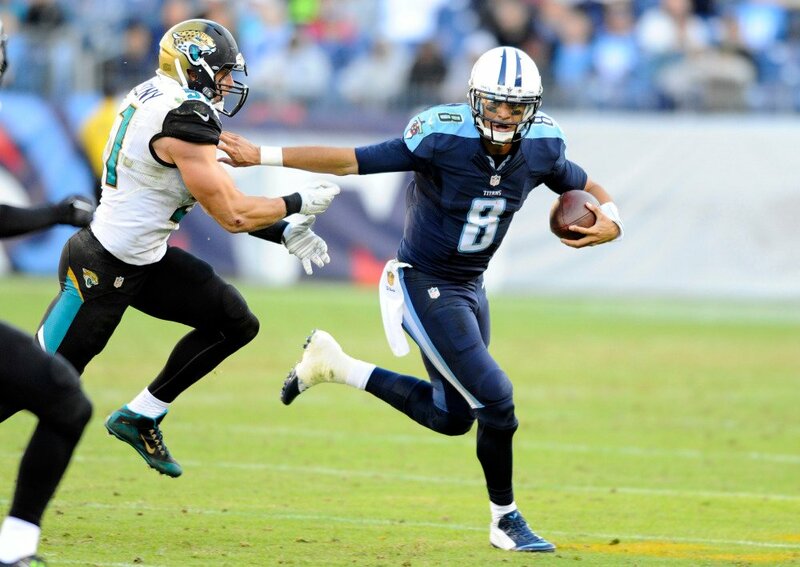 Rumblings from the Titans camp is that he may be cut or traded. He could give the team a good running back who can carry the rock and catch the ball out of the backfield. And Arian Foster is still out there as a free agent. His Achilles injury should be close to 100 percent now. If he’s healthy and hasn’t lost a step, he could still be an intriguing addition. The Patriots made a big acquisition this spring, signing tight end Martellus Bennett. 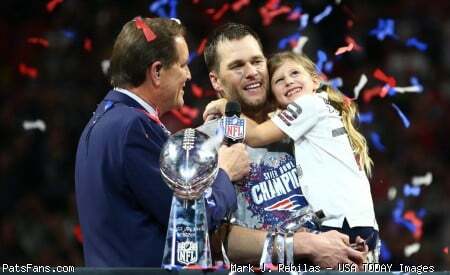 He and Rob Gronkowski present them with arguably the best tandem in the NFL. Both can block, attack the seams deep and give the quarterback a huge red zone target to work with. With Gronkowski absent for most of the spring, Bennett used the time to get his timing and chemistry down with QB Tom Brady. Now the coaches have to figure out how to best utilize their talent. One can easily envision them going to “12” personnel quite a bit with 1 RB, 2 TEs, and 2 WRs. Both Gronkowski and Bennett can line up in a variety of roles from in-line to split wide or in the slot. It gives them the option to pass or run with both tight ends excellent blockers and receivers. In certain situations, they could even go to a “13” personnel grouping with a single running back, three tight ends and a wide receiver. Clay Harbor or James Develin brings to the table the versatility to line up as a fullback, an H-Back or as a tight end. Harbor brings more to the table as a receiver and would definitely draw some favorable matchups. Watching the combinations of the offense during training camp promises to be one of most intriguing sub-plots of the summer. The Patriots have a much deeper front seven in 2016 despite waving goodbye to Chandler Jones and Akiem Hicks this offseason. They added big bodies to the interior defensive line with NT Terrance Knighton, Markus Kuhn, and Frank Kearse joining veteran Alan Branch and 2nd-year player Malcom Brown. They have the makings …on paper of having an immovable interior of the line. At defensive end, with Jabaal Sheard and second-year players Trey Flowers, Geneo Grissom and Rufus Johnson, they have a mix of youth and experience. They added to the depth by signing veteran Chris Long who was released by the Rams. 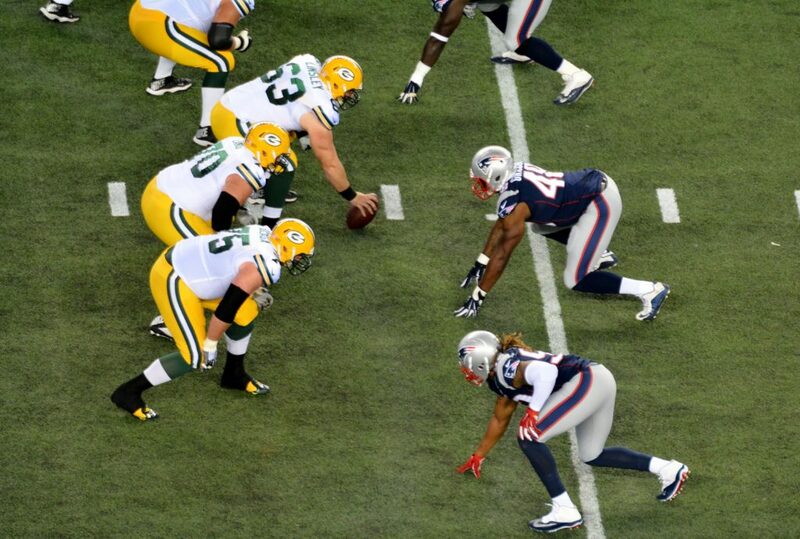 This depth is such that they played Rob Ninkovich at linebacker at times this spring. He and recent free agent signing Shea McClellin as well as Johnson add the depth to starters Jamie Collins and Dont’a Hightower. So with all of these pieces that can drop into coverage or rush the passer, Belichick and Defensive Coordinator Matt Patricia will have some tinkering to do with the personnel groupings. While a lot will have to do with matchups, the pass rush should be varied this season and look for the team to give opponents plenty of different looks. The Patriots’ OTAs and Minicamp resembled the end of the 2015 season, the list of who wasn’t there was nearly as important as those who were. The missing starters included Rob Gronkowski, Julian Edelman, Malcolm Butler, Logan Ryan, LeGarrette Blount, Dion Lewis, Alan Branch, Danny Amendola, Sebastian Vollmer and Nate Solder. Others not in attendance were Duron Harmon, Nate Ebner, Joe Cardona, Tre’ Jackson, Josh Kline, Shaq Mason and Frank Kearse. The good news was that the team had Gronkowski and Dion Lewis appear for the final OTA practice before breaking for the summer. Coincidence? Hardly. This is a way to show their opponents that these two players should be ready for the season. An intriguing fact surfaced this week when Tom Curran of CSNNE reported that the Patriots were going to take things differently with injuries this season in an attempt to stem the wave of injuries that decimated the team a year ago. So players who are dinged up may spend more time rehabbing injuries in the trainers’ room this year rather than attempting to play through them. After the epidemic that swept thru the roster in 2015, any change is worth looking at. But the team really needs their starters healthy and ready to go on September 11 when they open in Arizona. Having the players for training camp isn’t necessarily a true need although the OL could possibly benefit from the work against their defensive counterparts. So let’s hope that the team does their homework and due diligence and gets their Summer School work completed and ready for inspection. The Due date? July 27. 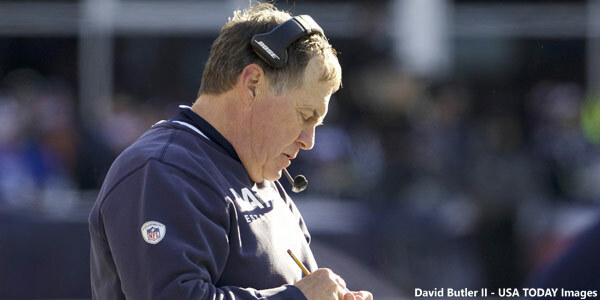 This entry was posted in Patriots Commentary, Patriots News and tagged 2016 Patriots Roster, 53 Man Roster Projection, Bill Belichick, Bishop Sankey, Danny Amendola, Dion Lewis, James White, Julian Edelman, LaGarrette Blount, Malcolm Butler, Martellus Bennett, New England Patriots, NFL, Patriots, Patriots edge rushers, Rob Gronkowski, Rob Ninkovich, Tom Brady, Trey Flowers on June 16, 2016 by Steve Balestrieri.